Is Windows enterprise support finally eroding? 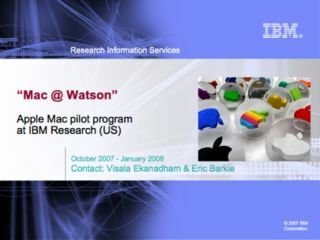 In what can only be seen as an example of the business world's growing affinity for Mac OS X, a leaked report suggests IBM is currently investigating the possibility of moving many of its employees from Microsoft's Windows platform to Apple's popular OS. According to documents obtained by Roughly Drafted, IBM initiated the first phase of its plan last October and ordered 24 MacBook Pros to be evaluated by its research team. After spending four months with the computers, the researchers found that Apple's notebook offers many benefits, including fewer security issues and greater popularity in the academic world where IBM has close ties. They like it! They really, really like it! The documents also revealed that of the 24 people asked to test the MacBook Pro, 22 said it offered a "better or best experience" in comparrison to the ThinkPad notebooks currently being used at the company. Ironically, IBM used to make ThinkPads before it sold its PC division in 2005. Perhaps most importantly, the report also said that only three of those asked to test Apple's notebook would rather use the ThinkPad as their office computer. Due to the success of the first phase, IBM now plans to initiate the second and third phases and acquire 50 to 100 more Apple notebooks to be evaluated by its employees.